Hewlett Packard - 435564-B21 HP/COMPAQ - INTEL XEON E5345 QUAD-CORE 2.33GHZ 8MB L2 CACHE 1333MHZ FSB SOCKET-LGA771 80W 65NM PROCESSOR KIT FOR HP PROLIANT BL460C G1 SERVER (435564-B21). NEW BULK. IN STOCK. READY TO SHIP SAME DAY. Hewlett Packard - 439827-001 HP/COMPAQ - INTEL XEON E5345 QUAD-CORE 2.33GHZ 8MB L2 CACHE 1333MHZ FSB SOCKET-LGA771 80W 65NM PROCESSOR (439827-001). NEW BULK. IN STOCK. SHIP SAME DAY. IBM - 42C0570 42C0570 IBM Intel Xeon DP Quad Core E5345 2.33GHz 8MB L2 Cache 1333MHz FSB 65NM 80W Socket LGA 771 & PLGA 771 Processor. New Bulk Pack. 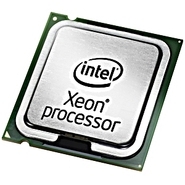 Hewlett Packard - 435564-L21 435564-L21 HP Intel Xeon E5345 Quad Core 2.33ghz 8mb L2 Cache 1333mhz Fsb Socket Lga771 80w 65nm Processor. New Bulk Pack. Hewlett Packard - 435954-B21 HP/COMPAQ - INTEL XEON E5345 QUAD-CORE 2.33GHZ 8MB L2 CACHE 1333MHZ FSB SOCKET-LGA771 80W 65NM PROCESSOR KIT FOR PROLIANT DL360 G5 SERVERS (435954-B21). NEW BULK. IN STOCK. READY TO SHIP SAME DAY. Hewlett Packard - 436013-B21 HP/COMPAQ - INTEL XEON E5345 QUAD-CORE 2.33GHZ 8MB L2 CACHE 1333MHZ FSB SOCKET-LGA771 80W 65NM PROCESSOR KIT FOR PROLIANT ML350 G5 SERVER (436013-B21). NEW BULK. IN STOCK. READY TO SHIP SAME DAY. Hewlett Packard - 437940-B21 HP/COMPAQ - INTEL XEON E5345 QUAD-CORE 2.33GHZ 8MB L2 CACHE 1333MHZ FSB 65NM 80W LGA771-PIN SOCKET PROCESSOR KIT FOR PROLIANT DL380 G5 SERVERS (437940-B21). NEW BULK. IN STOCK. READY TO SHIP SAME DAY. Hewlett Packard - 437945-004 HP/COMPAQ - INTEL XEON E5345 QUAD-CORE 2.33GHZ 8MB L2 CACHE 1333MHZ FSB SOCKET-LGA771 80W 65NM PROCESSOR ONLY FOR PROLIANT SERVERS (437945-004). NEW BULK. IN STOCK. READY TO SHIP SAME DAY. Hewlett Packard - 438362-001 HP/COMPAQ - INTEL XEON E5345 QUAD-CORE 2.33GHZ 8MB L2 CACHE 1333MHZ FSB SOCKET-LGA771 80W 65NM PROCESSOR FOR HP PROLIANT DL380 G5 SERVER (438362-001). NEW BULK. IN STOCK. READY TO SHIP SAME DAY. IBM - 43W5824 43W5824 IBM Intel Xeon DP Quad Core E5345 2.33GHz 8MB L2 Cache 1333MHz FSB 65NM 80W Socket LGA 771 & PLGA 771 Processor. New Bulk Pack. 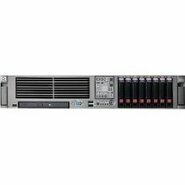 Hewlett Packard - 461273-001 461273-001 HP Proliant Bl460c 1x Intel Xeon Quad-Core E5345 2.33GHz 4GB RAM 2x Gigabit Ethernet 2-Way Blade Server S-Buy. New Retail Factory Sealed With Full Manufacturer Warranty. IBM - 38L6190 38L6190 IBM Intel Xeon Quad-Core E5345 2.33GHz 8MB L2 Cache 1333MHz FSB 65NM 80W Socket LGA-771 Processor Only. New Bulk Pack. Hewlett Packard - 435552-B21 HP/COMPAQ - PROLIANT BL20P G4 - 1P INTEL XEON E5345 QC 2.33GHZ 2GB RAM SAS/SATA HS 2 X GIGABIT ETHERNET ILO 8MB ATI RAGE XL BLADE SERVER (435552-B21). IN STOCK. REFURBISHED. SHIP SAME DAY. Hewlett Packard - 470064-511 HP/COMPAQ - PROLIANT DL380 G5 - S-BUY - 1P XEON E5345 QC 2.33GHZ 2GB RAM SAS HS COMBO 2 X GIGABIT ETHERNET ILO 2U RACK SERVER (470064-511). REFURBISHED. IN STOCK. SHIP SAME DAY.